SQL Server 2012 database administrators must configure contained database authentication SQL Server configuration option before they create contained database in SQL Server 2012 using sp_configure system procedure. Other wise, if "contained database authentication" is not set to 1 and enabled, an attempt to create SQL Server 2012 contained database will cause an error. Contained databases are new with SQL Server 2012 and enables easy migration of a database from one SQL Server server to another with all its authenticated user information like login users, etc. Recently I tried to create contained database on a fresh SQL Server 2012 installation. In order to create contained database on SQL Server 2012, in Options tab database admins can set the containment type to Partial instead of default None option value. Since most of SQL Server configuration options are still as default which are set during installation, I got the following error message during SQL Server contained database creation process. 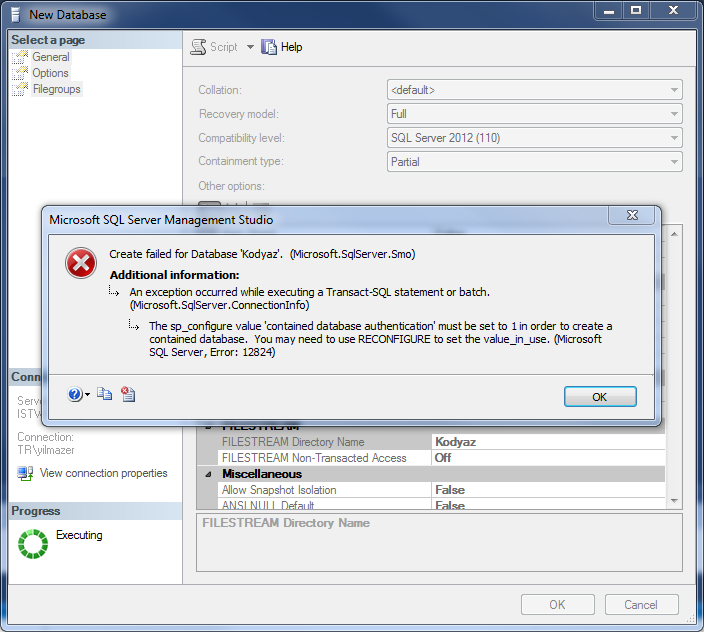 Below I copied some partial error message text shown with above SQL Server 2012 database create error. In SQL Server 2012, to set contained database authentication using sp_configure, following SQL script can be used. When a database administrator set 'contained database authentication' SQL Server configuration option to 1, he or she can create contained database on SQL Server 2012. Or using SQL Server Management Studio the contained database in SQL Server can be created without any configuration error.